"Right after the French Revolution in 1789 the passementerie industry suffered as did all industries that produced luxury articles. However, the production of the beautiful passementerie returned with the Empire, and Napoleon I commissioned regal passementerie to decorate the royal palaces. In the Spanish campaign of 1808, elaborate passementerie adorned Napoleon's tent. " 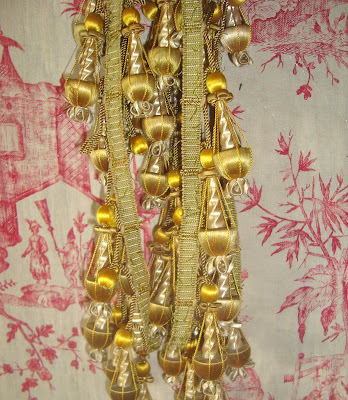 "The French word Passementerie means ornamental trimming and evokes the idea of luxury, opulence and sophistication in decoration. Trim, which is the English translation of the word, lacks the romantic and artistic connotations of the word." Both quotes from Antique French Textiles for Designers by June K Laval. I am only just discovering 'the joy of passementerie', and occasionally come across it in the form of simple silk gimps,braid and fringes, sometimes I may find something a little more fancy, but at the antiques fair last week I came across a length of this wonderful fancy trimmong in pretty good overall condition. It measures just under 4" or 10cms long including the woven braid. 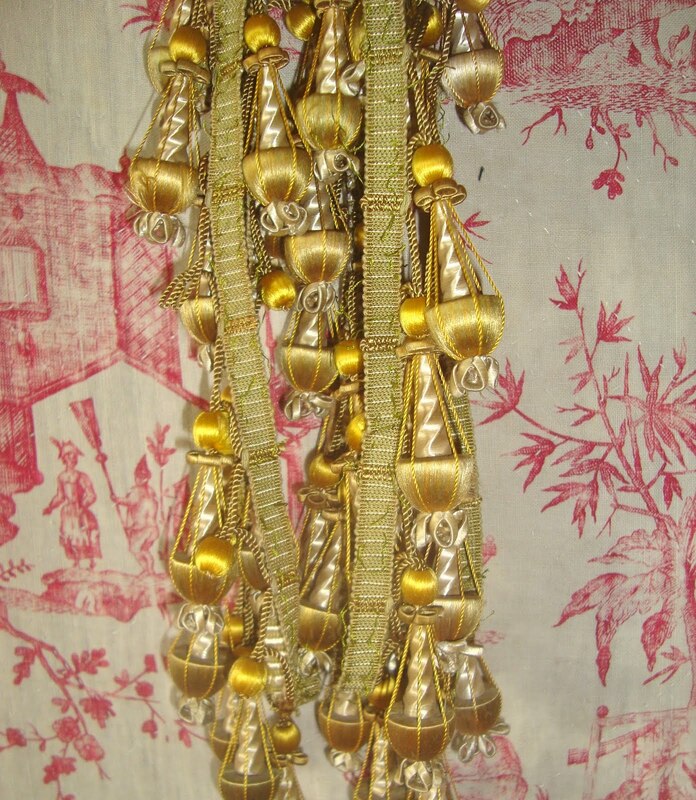 This length of silk-covered passementerie is probably the best I have discovered, very ornate, in what looks to be a Louis Phillipe style (produced around c1830) - see photos taken also from the above book - but I have a feeling from the construction and overall look that this example is most likely from the later 19th century or early 20th century the style of Louis Phillipe.